The transformation of Jerusalem’s status after Christianity was adopted as the Roman Empire’s official religion (4th century CE) and the city’s religious-Christian reputation attracted pilgrims from near and far. The exhibit includes a one-of-a-kind model of the Church of the Holy Sepulcher which presents a full and detailed view of the church in the 4th century CE. According to Christian tradition, during her visit to Jerusalem (326 CE) Empress Helena, mother of the Roman emperor Constantine, identified Jesus’ crucifixion and burial site within the Aphrodite temple. Constantine ordered the temple destroyed and the Church of the Holy Sepulcher built in its stead. The Church of the Holy Sepulcher has become the focal point of Christian Jerusalem. Church of the Holy Sepulcher, 4th century CE. Many sites in Jerusalem have been associated with events from the last days of Jesus’ life. These became pilgrimage destinations for Christians from all over the world. Beginning in the 6th century, religious processions were held on the city’s main street which connected the Church of the Holy Sepulcher to the Nea Church, Jerusalem’s largest church and to Mount Zion. Pilgrims along the Cardo, the city’s main street. A unique model of Byzantine Jerusalem. The model reconstructs the city’s appearance as it emerges from archaeological data and historical sources relating to the period. 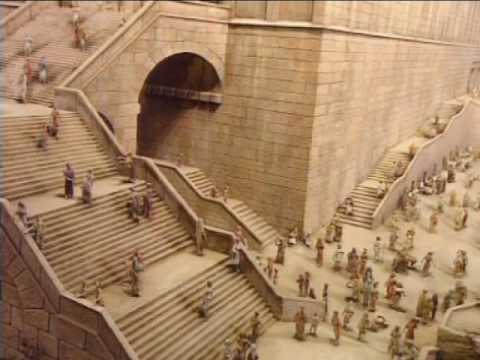 The model details the Cardo, the Tower of David (where monks stayed at the time) and the Nea, Holy Zion, Probatica and Siloam Churches. This is one of a number of models in the permanent exhibition presenting the city during different historic periods.